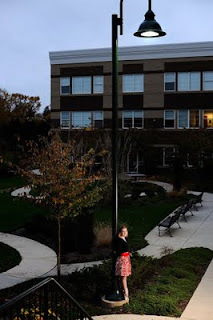 We were about out of light, though the idea was to simulate a warm light coming off of the building in front of her, but also show the light coming down from the lamp post. I brought the ambient down just a touch. Add 2 sb800's gelled at 1/4 CTO firing through an umbrella.